I was lucky enough to find this sweater at a second-hand boutique. The style is so classic that I don’t think it will ever go out of style! 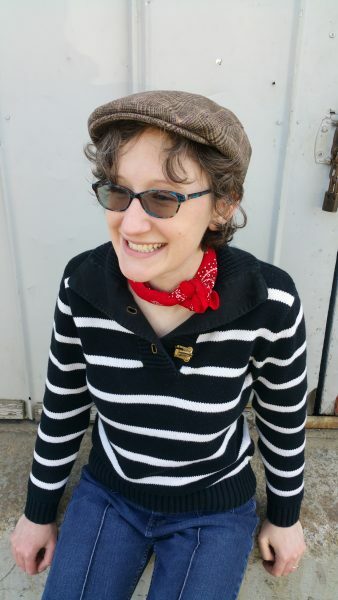 Those preppy stripes inspired me to wear the sweater in our Fashion Challenge: Wannabe French post. The sweater’s best feature is a super comfy fit- not too blousy, not too tight, not too warm, not too drafty, and 100% cotton! 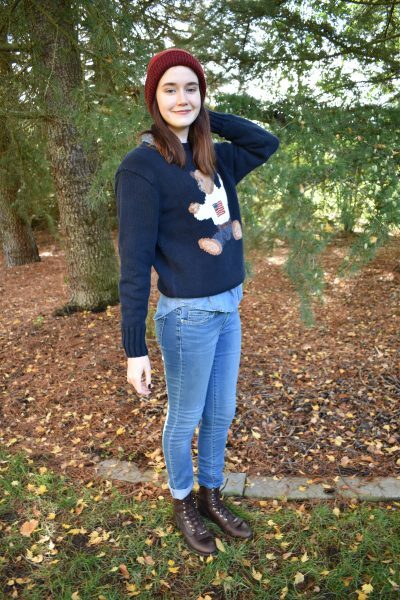 I styled the sweater with my vintage Levis from our Fashion Challenge: 1990’s Pants, cowboy boots, bandana, and a fav thrifted newsboy hat. 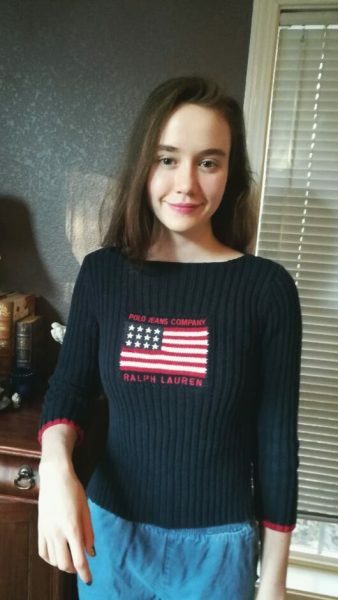 Lindee scored a Ralph Lauren sweater this fall! She couldn’t resist that preppy, patriotic flag! She paired the sweater with vintage high-waisted jeans. 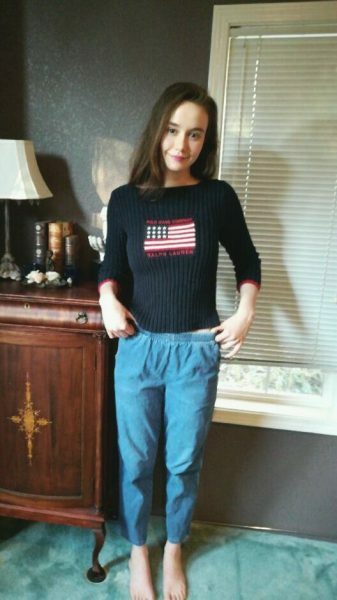 Although the flag motif is classic, the cropped length of the sweater suggests that it’s from the 1990’s. Since cropped sweaters are popular again, Lindee’s find was particularly timely! This next sweater is another thrift store score! I was super excited to find a wardrobe staple in such great shape! 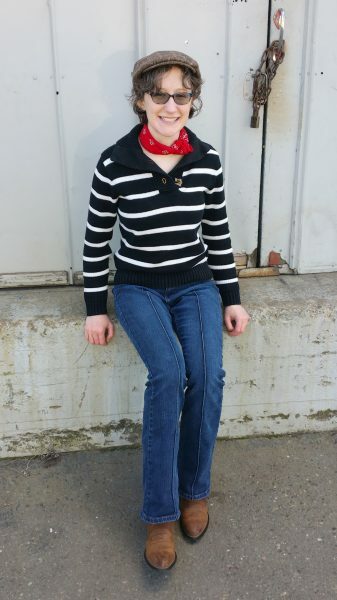 For this picture, I paired the sweater with a vintage wool skirt, but I regularly wear it with jeans and flats! I looove that cowl neckline- it’s flattering while still not exposing one to too much cold or too much sweater warmth! Classics are classic for a reason. Lindee first wore this vintage bear sweater for our Sweater-vember: Thrift Store Sweater Challenge! Although she wasn’t too sure at first, I convinced her to try this hand-knit, iconic piece. I love how she turned the preppy vibe a little more woodsy with the addition of a beanie, denim, and lace-up boots. 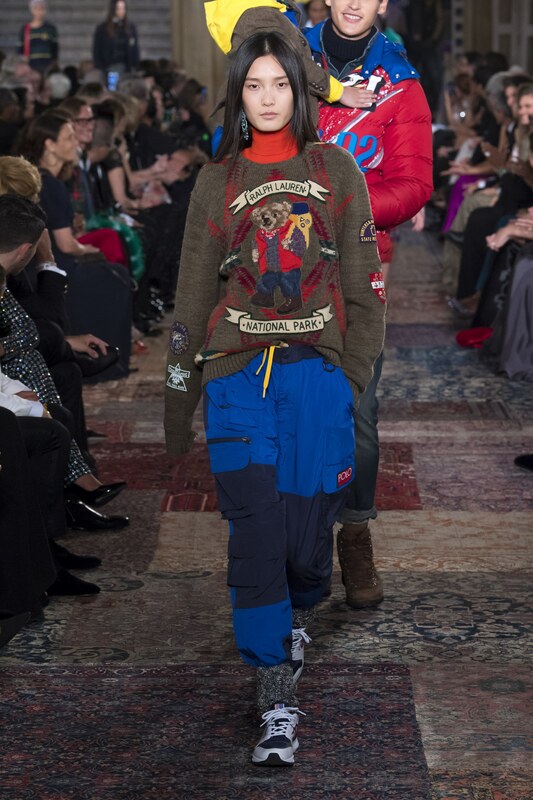 Turns out, Lindee wasn’t the only one styling this sweater! WOAH! Kanye West was apparently trying to copy her style!!! Lindee discovered his picture here at Spott while researching this trade mark Ralph Lauren piece! I may be biased, but I know who I would pick in a “who-wore-it-better” competition! 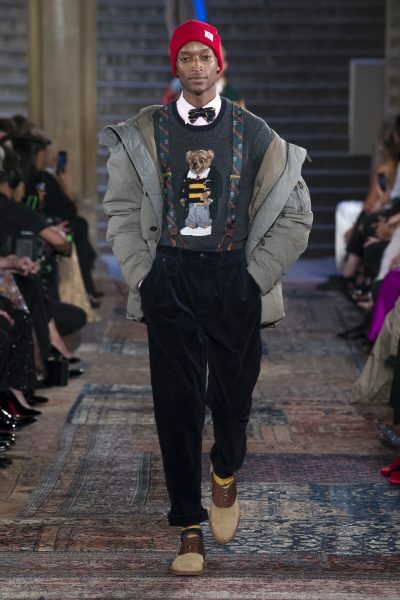 😉 Of course, new bear sweaters made appearances in the recent Ralph Lauren show! So Cute!